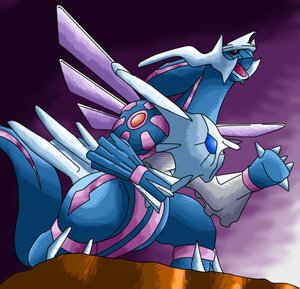 Dialga fushion Palkia. . Wallpaper and background images in the Legendary Pokemon club tagged: legendary pokemon dialga palkia. Oh that's from the manga...even though I've never read Pokemon manga I've heard that there's is a statue that is a combination of Dialga and Palkia in it. I thinks its because in Pokemon Platinum that's is what the statue in Eterna is supposed to look like (in Pokemon Diamond it's just Dialga in Pokemon Pearl it's just Palkia, but I think everyone on this club knows that, so I wasted my time writing that). They should show Reshiram and Zekrom fused .